The main pool of Clear Lake has a huge sunken forest in the bottom of it. 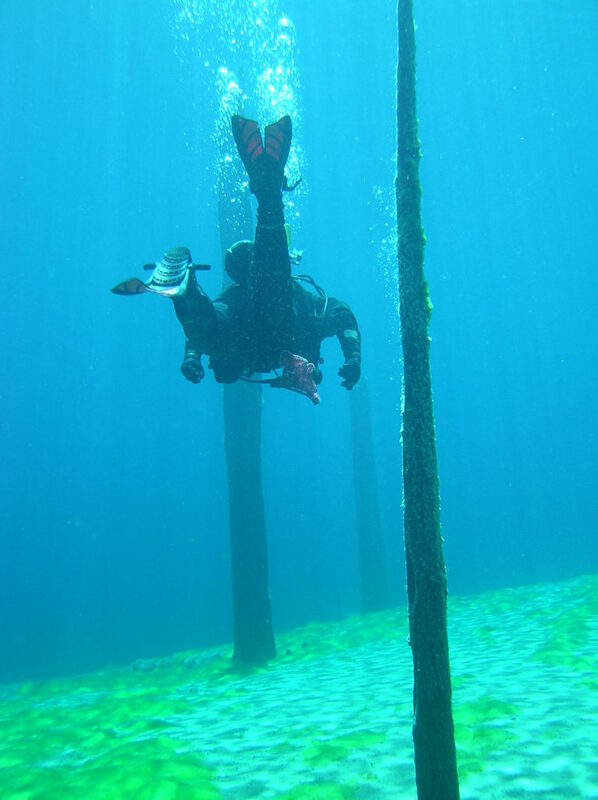 Visibility of 100+ feet means that you can see the surface when you’re at a max depth of 100 feet in some of the deep underwater spring holes at the bottom of the lake. A short surface swim is needed to reach the sunken forest. You don’t have to worry about motorized boat traffic on Clear Lake because all engines are banned on the lake. Clear Lake’s main pool from the shallows at the entrance. The three big draws at the main pool on Clear Lake are the visibility (100+ feet of viz! ), the sunken forest (80 foot tall tree trunks submerged underwater by a lava flow damming up the river! ), and the huge potholes in the bottom of the lake where clear, cold spring water flows up from the basalt rocks underneath. Sometimes you will also see a few trout and some freshwater shrimp at this site. The craziest thing at this site by far is looking up when you’re 100 feet underwater and seeing the surface. 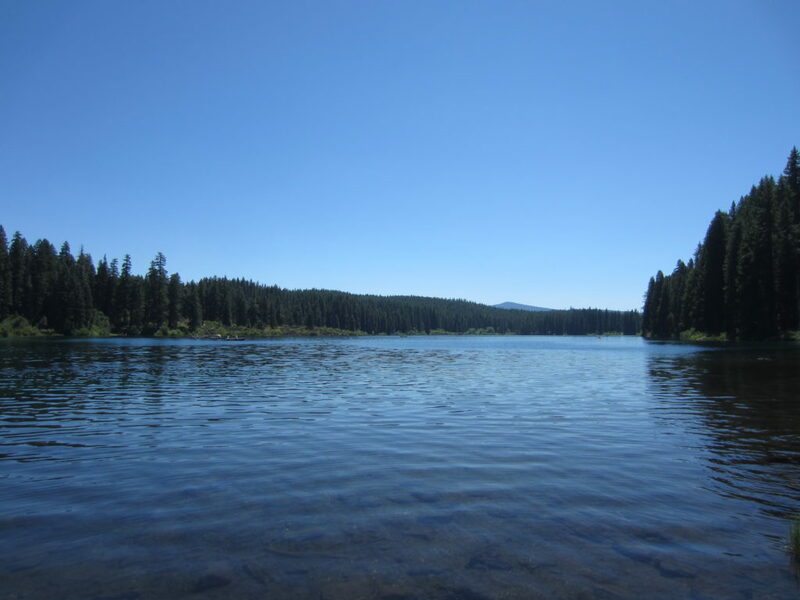 A lot of people will tell you that diving in Oregon is no fun because you can never see more than 20 feet but we’re here to tell you that at Clear Lake, you can see at least 100 feet when you’re underwater. Clear Lake is in the middle of nowhere. The closest towns of any size are Eugene/Springfield, Albany, Bend, and Salem. Smaller Oregon hamlets like Rainbow, Marion Forks, and Sisters have basic services like gasoline and convenience stores or restaurants but they are all a long drive away. If you are coming from Salem or North, you will take the North Santiam Highway (State Highway 22) from Salem toward Bend. At Santiam Junction, follow the signs for Eugene onto US 20 West and then onto State Highway 126. If you are coming from Albany or Corvallis, US 20 East to Santiam Junction is the fastest way to go. Then follow signs for Eugene down State Highway 126 (McKenzie River Highway). Coming from Eugene and the south, take State Highway 126 out of Springfield up the McKenzie River. If you’re coming from Bend, follow US 20 East to Santiam Junction. Once you’re near the lake, you will see signs for the Clear Lake Resort. You will turn onto National Forest Road 775 (paved). Note that this is a one-way road! It is well signed. Then follow the road down until you are near the lodge and you find paved parking. In the fall, winter, and spring, there is usually ample parking at this site in free day-use parking spots to the south of the lodge at the resort. In the summer, it can become very difficult to find parking here. Day use parking is free but fills up fast in the summer. Winter is a good time to dive to beat the crowds at Clear Lake. This site can get a little complex once you’re underwater because of how big it is. Generally, you want to go north and west to find your way back to the exit. When you enter the water, you want to head east and south to find the potholes and the sunken forest. If you go too far south, you will end up at the other end of the lake and have either a very long surface swim, or a very uncomfortable hike back to your car. The best place to enter and exit is to the south of the day use parking area. There is a small path through the forest for about 200 feet to get to the entrance. The entrance is easy to walk into although at times there can be a submerged log or two to stub your toe on. Most people shouldn’t have any trouble with this entrance and exit. This is a freshwater dive. This is a shore dive although you can put in non-motorized boats on the lake. A boat could be useful if you want to more directly access the underwater forest without as much of a surface swim. Checking out a cold freshwater spring in a deep pothole in Clear Lake. Be aware that when you go into these potholes, your chance of a frozen or free flowing regulator increase because of the depth (increased air consumption) and the temperature (ice cold water out of the springs). This lake is usually a pretty calm place. There is more boat traffic in the summer although none of it is motorized. Lots of anglers come to fish the lake so watch out for lures and line. Visibility here is usually 100+ feet. It’s not unheard of to find 200+ feet of visibility in the fall before the winter rain and snow starts. If you stir up the bottom, in most the lake the water will clear pretty quickly. 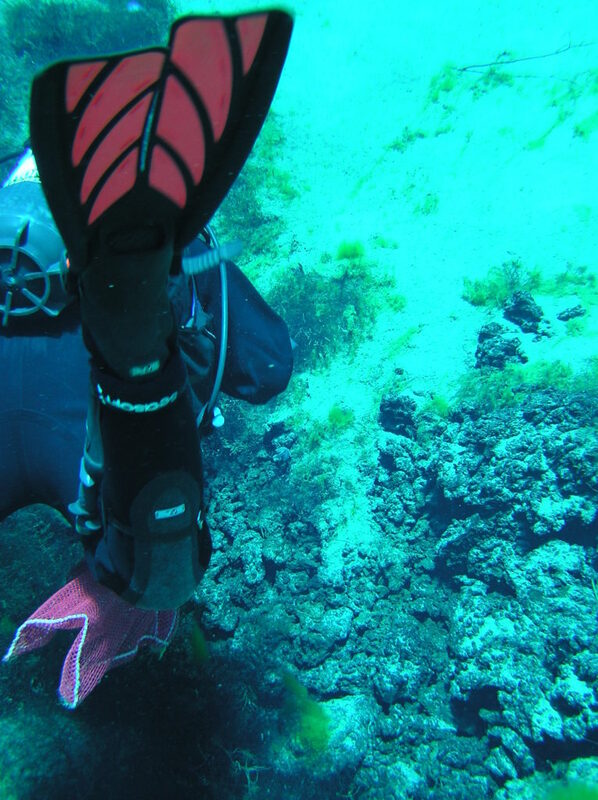 However, you should try to maintain good neutral buoyancy control to not spoil the viz for anyone else diving or people who are swimming or boating. We have seen it as high as 42F and as low as 31F at this lake. Sometimes a very cold layer of water (thermocline) can be in the top few feet of the water column. The water coming out of the springs in the potholes at the bottom of the lake can be 31F at the right time of year. This makes it much more likely that your regulator will freeze up or free flow at depth. We had one of our first stage regulators freeze and free flow at 100 feet in a pothole and had to abort the dive. We know some people who have gone diving at Clear Lake with a wetsuit but we sure are happy to have drysuits for this dive. Fall, winter, and spring are the best for beating the crowds. Fall has the best visibility but the viz is never bad here. You can go deep in the main pool at Clear Lake. We have hit 100 feet in some of the deep holes and could have gone deeper if we wanted. Remember that this is an altitude dive so your bottom time changes compared to sea level. When you are at depth with this cold of water, you can have your regulators freeze and free flow. It happened to us once here. If you are in doubt about your gear, get a qualified professional at your local dive shop to examine your gear and tell you what conditions are safe for your gear to operate in. Even with good gear meant for cold water, freezes and free flows are still possible. Deep, clear water awaits SCUBA divers at Clear Lake! A whole underwater forest is down there, just waiting to be explored. Advanced open water training is a must for this site. It is big, deep, and cold. A deep diver specialty class will also be useful here. Altitude diver training is necessary so that you can dive this site safely. it is over 3,000 feet above sea level at the lake. The entrance and exit are easy, the current is very mild, the visibility is excellent, but this can be a challenging dive because of the cold and the depth. You need to be confident in your emergency ascent abilities. You also need to be able to deal with the cold water. The gentle path through the forest is about 200 feet from the day use parking area down to Clear Lake. If you have to park in one of the further away parking areas, it will increase your walk a bit. You can start diving right away from the entrance. 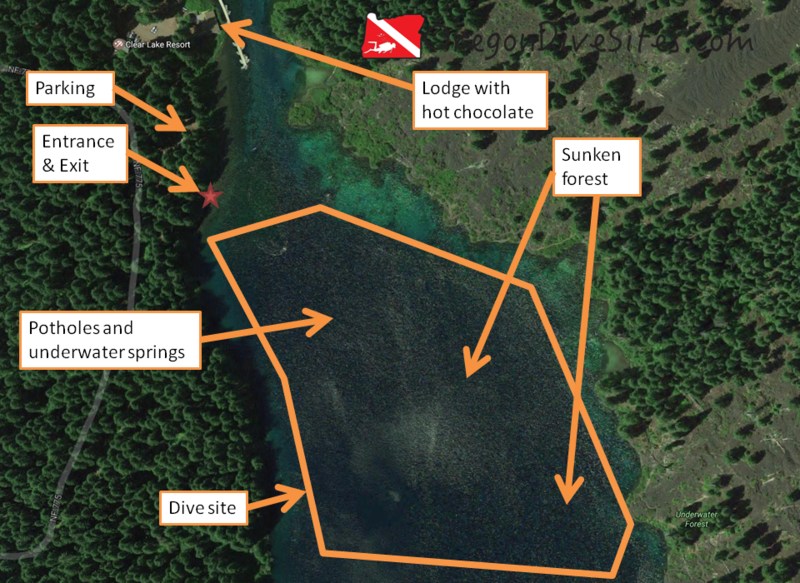 We suggest kicking out into the lake 500 to 1000 feet from shore heading due east before you start your dive. This will give you maximum bottom time at all of the interesting stuff (the underwater forest, and the potholes and springs). For those who don’t mind a long surface swim, going all the way to the east shore and starting your dive from there will maximize what you see with a tank of air. Remember that this is a deep, cold dive. Regulator freezes and free flows do happen. It happened to us once here. Be prepared to abort your dive and immediately ascend to the surface if you have a free flow. This is an altitude dive and can be a deep dive — both require special training. It’s a good idea to take a flashlight to check out the deep fissures in the bottom of some of the potholes where the underwater springs are. We have our favorite lights listed on our Gear We Use page. There are no close dive shops to Clear Lake. You will need to go to Eugene, Salem, or Bend to get any gear serviced or tanks filled. You need to be self sufficient at this dive site. The lodge at the resort on Clear Lake has limited hot food options and good hot chocolate. Otherwise the closest restaurants you will find are down the McKenzie River toward the town of Rainbow or down the North Santiam Highway at Marion Forks. If you want to go over the pass, Sisters has some good restaurants. The resort on Clear Lake rents out cabins. Call ahead and ask about renting a cabin for SCUBA diving. Don’t be “that guy” and bring your wet, smelly gear inside the cabin if they tell you not to. There are a couple national forest campgrounds around the lake. You can also camp in the national forest down some of the forest access roads. Check at the local district ranger office about specifics for primitive camping. Sometimes there are restrictions due to logging operations or fire danger.